Are you looking to see what happens in Green Lake? We are not what you would call an “inactive” town. Quite the opposite! 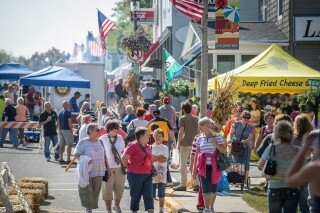 We always have something happening, whether our huge 4th of July celebration, Water Ski Show, or renowned Harvest Fest. For detailed information, please visit our calendar. The Farm Market is located on Town Square Lawn/Mill St. 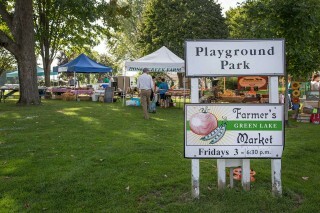 The Market will feature Local farmers and Artisans. The Market hours are 3 pm-6:30 pm. Featuring music from many different genres, come on down to Deacon Mills Park and enjoy some live music next to our beautiful wharf! Chalk Walk is a fantastic family friendly event where artists of all ages and skill level decorate the sidewalks with wonderful chalk art. This event is held in collaboration with the Green Lake community’s Splash into Summer in Playground Park where local businesses and organizations lead a family-fun event featuring games, prizes, food, a fishing contest, and so much more! 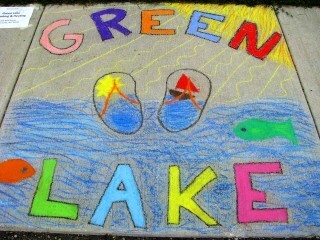 Every year we celebrate our independence with old and new events and activities throughout Downtown Green Lake. The celebration begins bright and early with a fantastic pancake breakfast served by the American Legion’s Auxiliary branch. After breakfast, the great festivities continue and include the Legion’s Sink the Bismarck golf game, live music, delicious food sold all day, the much-anticipated 4th of July parade, and more! Check out the full schedule here! Can you say ” Fun”? This event promises to bring it all to you! 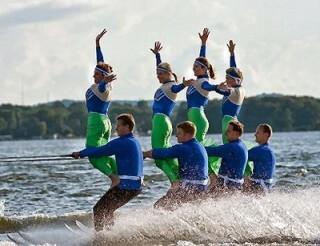 Enjoy Swimming, a Picnic, Live Music and a Free Waterski Show. So grab your beach blankets and chairs and come out for a fun filled day. No matter what time of year it is, everyone looks forward to Harvest Fest. This two-day celebration transforms downtown Green Lake into a haven for all things fall! With a craft faire, farmers market, food vendors, a parade, car show, and live entertainment… what more could you ask for? For more information on these festivals, feel free to call us at 920-294-3231 or consult the event’s website. The Green Lake Area Half Marathon and Fun Run is a event that provides a great opportunity for a picturesque run through the City of Green Lake and west along wooded lanes and the breath-taking shoreline of Green Lake. For the eighth consecutive year Norton’s Dry Dock will be sponsoring AYA this is an opportunity for the whole family to spend the day together on Green Lake, while giving youth an introduction to competitive sport fishing in a fun, friendly and family oriented atmosphere. It’s the party of the summer: Boat Jam on Norwegian Bay! 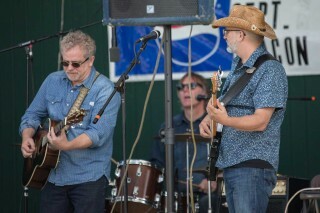 Every year, Shoreline Boat Center puts a band on a barge, puts the barge on the bay, and celebrates the lake lifestyle. Bring your boat or walk the boardwalk to join in the fun. There’s never a cover charge so bring the whole crew! Heidel House Resort & Spa’s 6th annual beer tasting event will feature over 100 different Wisconsin microbrews to choose from! Mingle among representatives from the state’s finest craft breweries and sample their newest and most beloved flavors in your souvenir tasting glass. The Green Lake Fine Arts Fair is heralded as one of the best art shows in the Midwest. Taking place in beautiful Playground Park, vendors have a variety of beautiful products and visitors will certainly connect with one vendor’s products…if not them all! A fun weekend that includes films, panels, live music, local food, and workshops presented to the public, critics, students, aspiring filmmakers, and activists. This event is a global storytelling platform featuring films about people, wild animals and ecosystems that are facing daunting challenges. These are stories of hope and inspiration. Freeland is a frontline, counter-trafficking organization working for a world that is free of wildlife trafficking and human slavery. Freeland’s team of law enforcement, development and communications specialists work alongside partners in Asia, Africa and the Americas to build capacity, raise awareness, strengthen networks and promote good governance to protect critical ecosystems and vulnerable people. The Green Lake County Fair is a county-supported Fair that offers a fun, safe, family-friendly event. It is held annually the first weekend of August. The Fair is a long tradition that locals and visitors wait for. Known as “the best little fair around,” bring your family and see why! Since its founding in 1979 the Green Lake Festival of Music has proudly presented world-class artists from throughout the U.S. and abroad. Audiences love the intimate and relaxed nature of performances at the historic Thrasher Opera House in Green Lake, Wisconsin and in Demmer Hall at Rodman Auditorium at Ripon College. The GLFM boasts a reputation of discovering rising stars and featuring artistic talent of the highest quality. Local builders and homeowners alike graciously open their doors to the public to showcase the beautiful landscapes, architecture, and natural beauty of our Green Lake. Kick off your shoes and make yourself “at home” with us for a day! Hosted by Heidel House Resort and Spa, gather your family and friends together for this summer party on the lake. Delicious food, specialty drinks and live music by two renowned bands highlight this crowd-favorite event. An exciting fun-packed weekend full of festivities along with exploring nature at its finest are all part of the Whooping Crane Festival, located in Princeton, Wisconsin. Cranefest is a one-of-a-kind event families and festival goers and nature lovers do not want to miss. Sip and swirl your way through Wisconsin-made wines at Heidel House Resort & Spa’s third annual Wine Fest. Experience an incredible selection of flavorful varieties as live music accompanies your visits to the winery representatives. Between samples, relax and enjoy a delicious array of hors d’oeuvres and the beautiful views of Green Lake. The Wisconsin State Chili Cook-Off has grown from a few dozen people partying in the park into one of those can’t miss events that brings people back to Green Lake year after year. Hot chili, live music and cold beverages on the waterfront—what more could you need? At the Annual Wooden Boat Show in Green Lake, there are no judging or awards, just fellowship with other wooden boat enthusiasts, and sharing the workmanship of these classic boats with the public. This show is open with free admission to the public.